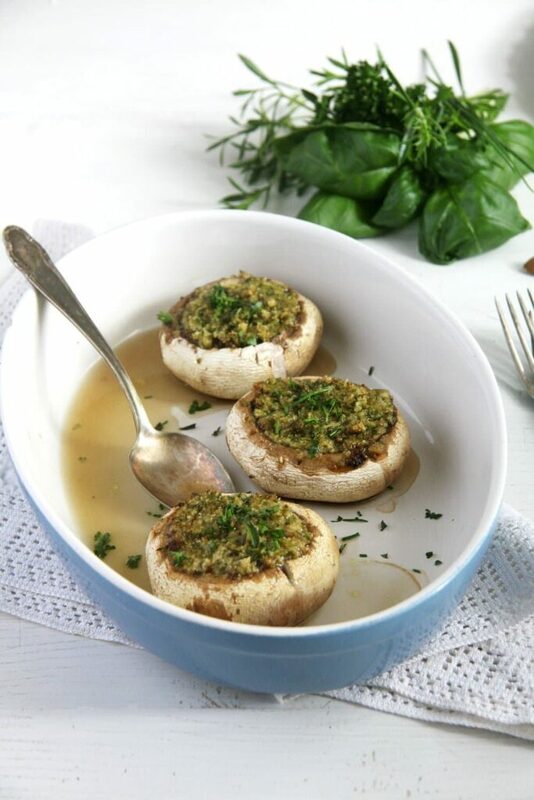 Brown mushrooms filled with a melt in you mouth, aromatic herb butter and almond filling, this is my favorite way of serving stuffed mushrooms. I cannot even remember how often I cooked this recipe since discovering it sometime this spring. I was looking for something herby, which would allow me to use some of the herbs that had just started growing in my garden and I came across this recipe in a German vegetarian book (Vegetarische Küche), which I bought several years ago and out of which I had never cooked anything before… Sad, but when you have about 130 cookbooks + dozens of scribbled notebooks + even more magazines + the internet it is hard to keep up to date and actually use every book you have. 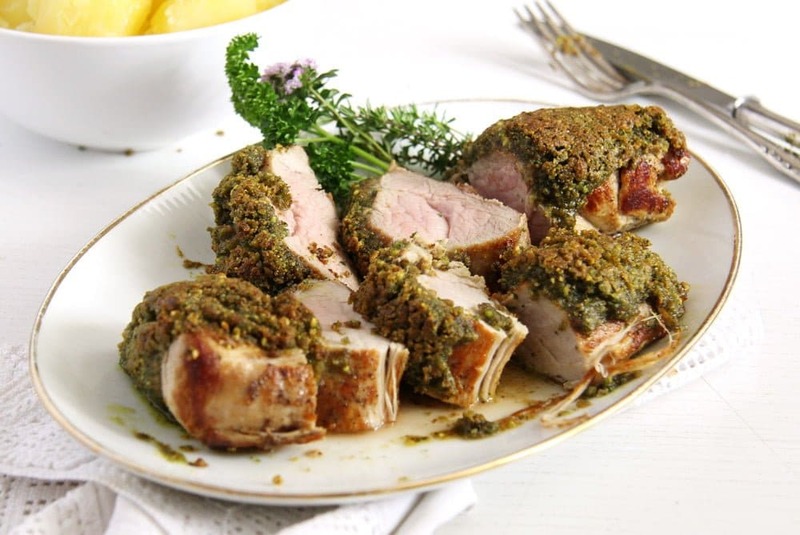 However this recipe is a total hit, one of those kind of rare recipes, which once developed to perfectly suit your own taste, becomes a staple in the kitchen. It is something my kids won’t touch (mushrooms are stuff from the devil in their opinion – it just can’t get any worse when it comes to vegetables and food generally), but my husband and I (and everyone else who got to taste these mushrooms) find that when it comes to mushrooms it can hardly get any better. 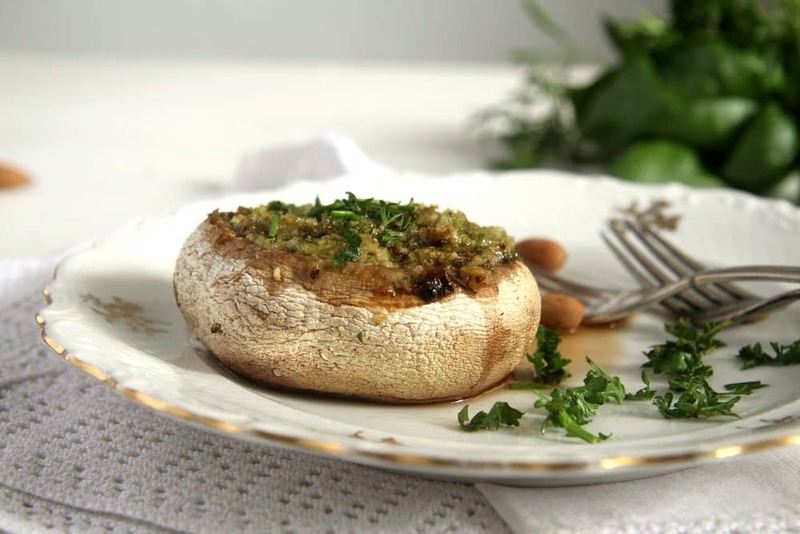 And we do love our mushrooms and have many other delicious ways of enjoying them, but this recipe is certainly one of the best. To make the filling I use whatever herbs I happen to have in the garden: parsley, thyme, rosemary, chives, sage, savory… you name it. I either use a mixture of many or maybe just a couple of them. 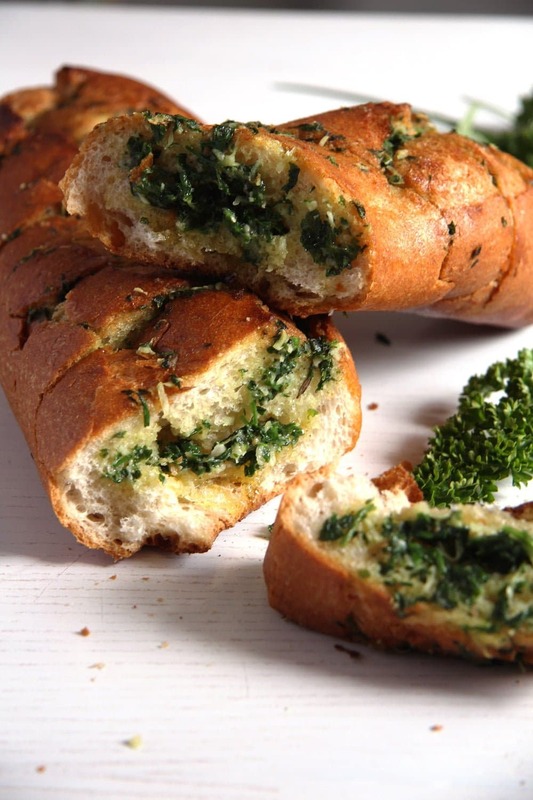 You can definitely use frozen herbs as well, and for a quick version you could even take ready made herb butter. But in case you do that, I have to say it again, making your own herb butter is a matter of minutes and the end result is about a 1000 tastier than anything you could buy. 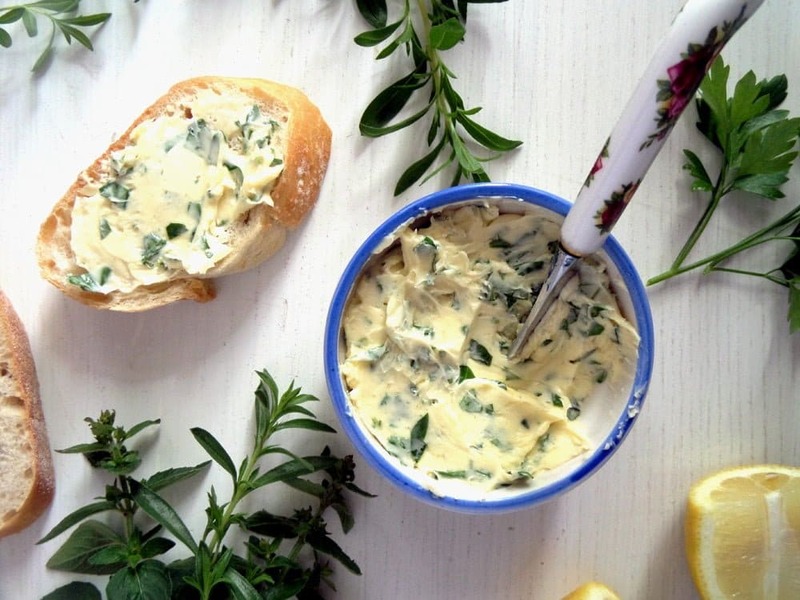 You could use my recipe for herb butter if you like, make more of it so you have enough for this recipe and for enjoying with grilled meat or veggies, or to just smear on your bread. I recommend using brown mushrooms, I find that, when baked, they keep their form better than the white ones. I used medium sized ones, but I find that keeping the balance between the amount of filling and the number of mushrooms to be stuffed is a bit difficult, so called “medium” mushrooms come in such different sizes around here, sometimes their opening is wide, sometimes not… if you happen to have too much filling, don’t worry, eat that on bread or stuff a tomato with it. 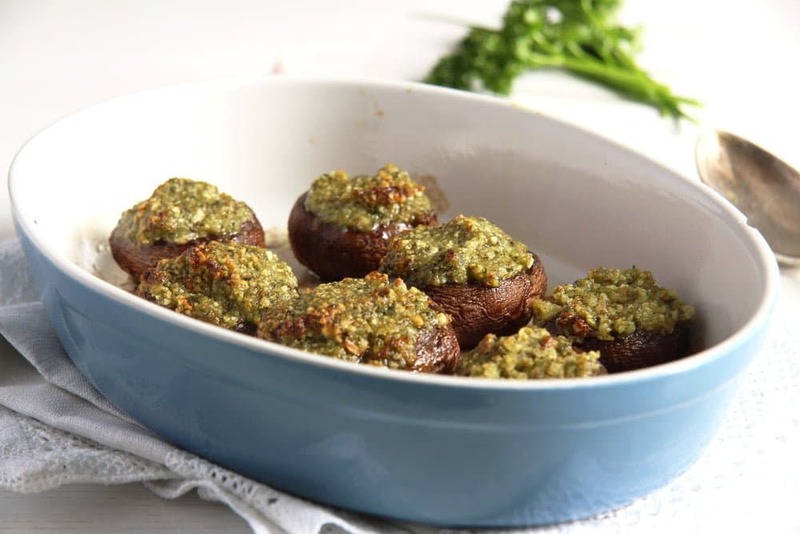 And if you have too many mushrooms, you could chop the stems and mix them with pesto, cream cheese or grated cheese, for instance. I use blanched almonds because they are white and that allows for a nicer green color of the filling. If you cannot find the blanched almonds and don’t feel like removing the skin yourself, do use almonds with their skin on, the color of the filling is not so bright anymore, but the taste won’t suffer. Preheat the oven to 180 degrees Celsius/ 360 degrees Fahrenheit. Lightly brush a casserole form with some oil. Remove the mushroom stems and chop them very finely. Chop the shallot very finely as well. Heat the tablespoon olive oil in a pan and cook the shallot for about 2-3 minutes or until soft. Add the chopped mushroom stems and continue cooking for further 2 minutes or until the stems are soft as well. Place the almonds, the roughly chopped garlic cloves, herbs and the cubed butter in a food processor. Process shortly to obtain a slightly rough paste. Add a little lemon juice and salt and pepper to taste. Place the mushrooms in the prepared casserole dish and fill them with the almond filling. Bake for about 10 – 15 minutes until they are soft and the butter is melted. Serve them immediately with baguette and green salad. Mushrooms are one of my favourite veggies, for sure! So earthy and flavourful. And this recipe is just perfect; I have a lot of herbs in the garden and I’m pretty sure it won’t be long before they will be gone for the season as the weather gets cooler. Great way to use them up! Wow 130 cookbooks! 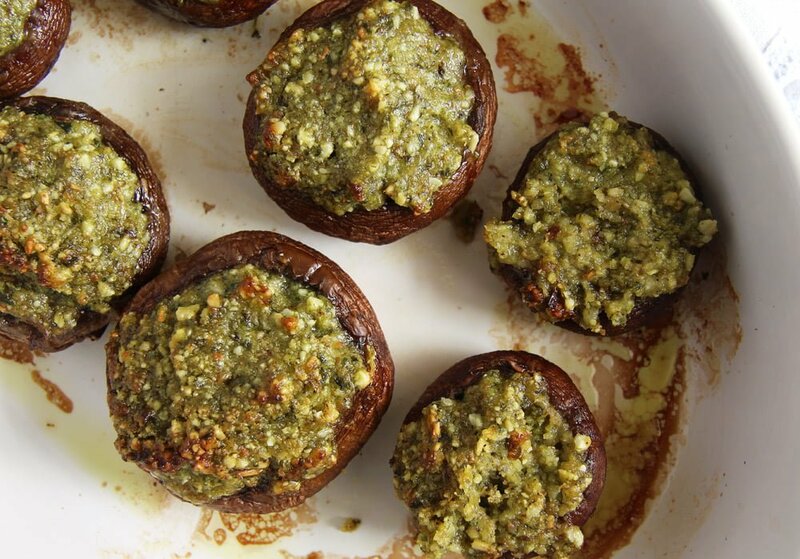 The internet is stuffed full of recipes but isn’t there something so special about thumbing through the sauce splattered pages of a good cookbook 🙂 These mushrooms are mouthwatering, the earthy green herb filling is my favorite I can just imagine how fantastic they taste. 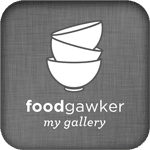 I am completely guilty of collecting cookbooks and never making anything from them 🙁 I like to pick one up when I travel to new places with interesing cuisines. I think I will try to make one recipe from each of my 100+ books too!. Love this recipe, and pinned it later! Eeekkk I love love love mushrooms! And with herb butter filling?? Oh my. I need to try these!! They look delicious, it’s a shame the little ones don’t like mushrooms. I wasn’t keen on mushrooms as a kid, but now I would eat them daily, this is how much I love them. Maybe it will be the same for them. 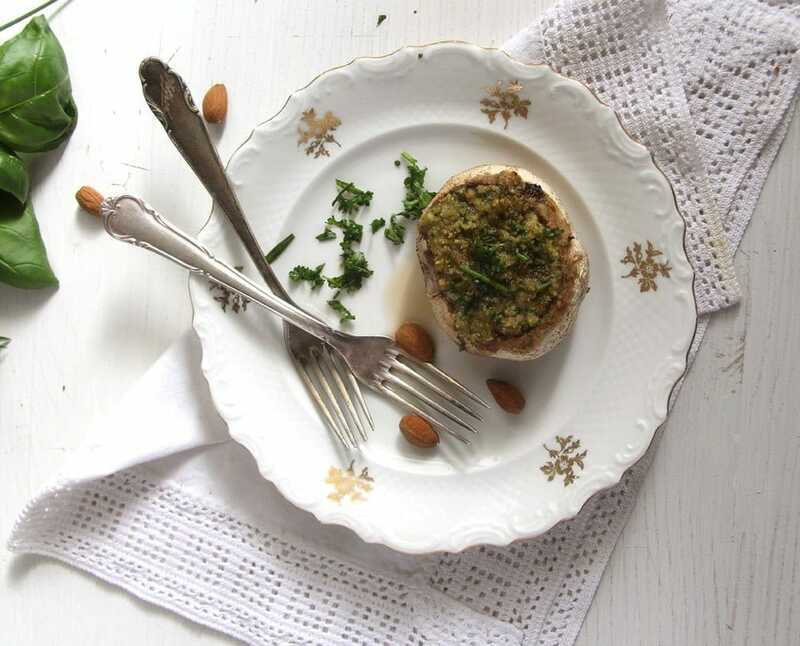 Love recipes made with mushrooms and this one with the green herb filling sounds really indulging. I bet they tasted divine. I haven’t made stuffed mushrooms in ages! This looks wonderful and I really like that vibrant herb filing. You are reading my mind, Adina! I have such a jungle of herbs on my balcony and appreciate so much new recipes calling for a lot of herbs. I love everything about this recipe! The mushrooms look really fantastic. (I stopped counting my cookbooks a long time ago when their number scared me… but I have never stopped buying them ! Also from time to time I try to cook something from every book I own…. In vain!). Seriously, what a great combo, I bet these little mushrooms taste amazing.